Solihull is a large West Midlands town that is buzzing with activity around the clock. Located about 8 Miles Northwest of Birmingham, Solihull is placed at a center location in the West Midlands region and is highly regarded as one of the most customs, traditions and assets rich regions of the UK outside of London. For all the Silhillians, Impress Blinds offers high quality affordable windows blinds that can turn your interiors into design, color and elegant marvels. We offer a large variety of materials, designs and styles of windows blinds that can complement, match, contrast or create your theme designs efficiently providing all the required functionality at the same time as well. If you are someone who appreciates daylight, warmth from the sun and natural looking designs, our perfect Vision or Visionary Blinds will suit your interiors best. With surface perforated designs, Vision Blinds provide window designs while still staying on the windows as well. Vertical Blinds are great options where you want unique designs and privacy at the same time. Conservatory Blinds offered by trusted Impress Blinds can convert your conservatories in Solihull into functional spaces that you can use any way you wish. Affordable and Cheap Roller Blinds can come in any required printed designs on a budget keeping all users happy at all times. 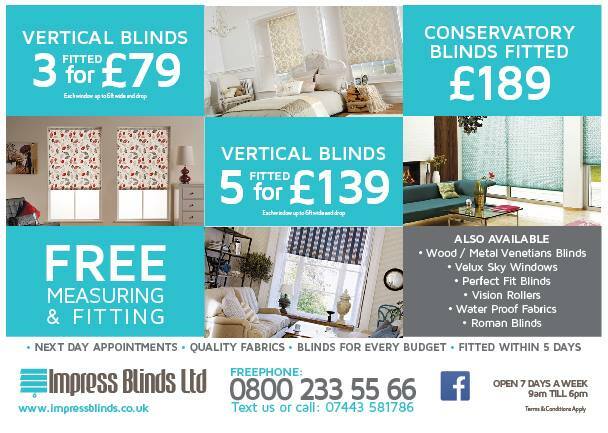 Other great options from Impress Blinds are Cheap Roman Blinds that are made from fabric materials, luxury Wooden Blinds made from real wood materials, Metal Venetians containing durable aluminum strips and Velux or Shutter Blinds that cover either side of your windows closing them perfectly. When it comes to a large canvas that will go on your walls and windows, you want designs, colors and patterns that go with the rest of your thematic designs. Impress Blinds offers you many different varieties of windows blinds with unique materials, printed or material designs and color themes. If you need to complement your wooden designs with similar materials and colors, Wooden Blinds will help well. Cheap Roman Blinds and Roller Blinds can complement and contrast thematic fabric designs perfectly and Vision Blinds can look elegant in any type of office or commercial setting. Conservatory Blinds are offered in different material and Made to Measure Blinds finish on your windows covering each and every inch of space perfectly. Add patterns with Metal Venetians or have your patterns and textures printed on Roller and Roman Blinds, whichever combination you are looking for, Impress Blinds will provide most efficiently. Our major clients in Solihull (UK) are much satisfied with our services.